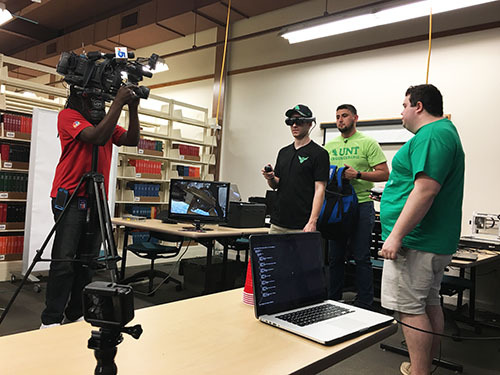 Department of Computer Science and Engineering juniors David Woodward, Tim Stern and Juan Ruiz are reaching for the stars with an augmented reality program that could change the way astronauts communicate in space. The team will travel to the Johnson Space Center in Houston April 14-19 to compete in the NASA SUITS design challenge. The students will present their AR programming to computer scientists, engineers and astronauts. During the competition, the team’s program will be tested by a NASA astronaut on the space agency’s mockup of the International Space Station. The UNT team will face off against student teams from the University of Akron, Bradley University, Boise State, University of Colorado – Boulder, University of Michigan, University of Wisconsin – Stout, Virginia Tech, Inter-American University of Puerto Rico, Valencia College, Santa Monica College, Texas A&M – College Station, Riverside City Community College, Stevens Institute of Technology, University of California – Santa Cruz, and Harvard University.